It's been cold here today. Even inside. I was so cold that I just tried to warm up in my bed, with two blankets on me, but it didn't help. My hands are still ice cold. But I had some fever before, but it's just due to my asthma. When I get sick my asthma always gets worse, which makes me tired since my defense is fighting it all the time. So I'm gonna go to the store soon and buy some food, drinks and pro-defense yogurt etc. I think I'll wake up some when I get outside in the cold again. It is kinda beutiful now though. I love autumn, with the colorful trees, rain and time to stay inside drinking tea and reading books. It's my birthday soon too! 1 Oct, the same day as China's national day, which I learned from Shi. 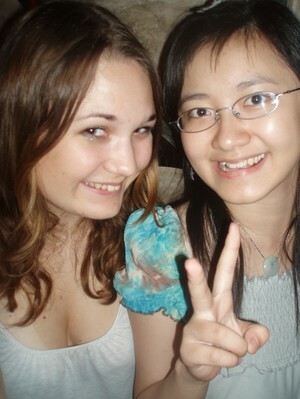 Funny picture of me and Shi when I went to visit her in China 2007. So, since it's my birthday this friday my partnes and sister are coming here tomorrow, so will my cousin Madeleine, and we'll eat some pizza and cake! Fun! Then later tomorrow, 11PM, Markus will finally come! Then Saturday some of my Stockholm girls will come and visit me here in Uppsala for the first time! Yay! Looking forward to it. AND THEN (fully booked weekend, I know!!) Markus' mom and sister will come so we can spend some time together as well, and they'll have the opportunity to see Markus again, since he's studying in another town as well. 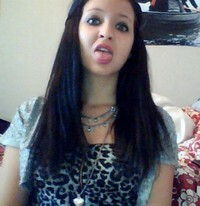 Urgh I'm so tired. I can't spell or write grammatically correct in any language then. I hope it made some sense at least. Haha! Vet att ni snokar omkring här, mor och syster! Men usch då haha.. nja, det var ett tag sedan jag var in här faktiskt. Men bloggen är jättebra!